You'll feel like you're strolling the streets of Havana when you vape Logic Smoke Havana, cigar flavored e-liquid. With a true cigar taste and aroma. This has become a favorite amongst many cigar aficionados. And when using your MOD to enjoy this classic cigar flavored e-liquid, you'll get voluptuous clouds of vapor as if you had had an authentic tobacco cigar from Havana. 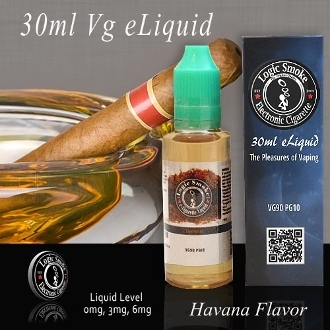 Try this and our other cigar flavor Logic Smoke e-liquids and start enjoying today.